^ Red Giants. HyperPhysics（hosted by the Department of Physics and Astronomy of Georgia State University）. [2006-12-29]. ^ Strobel, Nick. Stages 5-7. Lives and Deaths of Stars. 2004-06-02 [2006-12-29]. 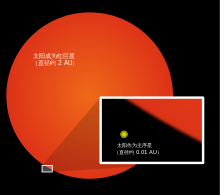 ^ The fading: red giants and white dwarfs. [2006-12-29]. ^ Earth may still be vanish before sun expands further on. [2008-03-25]. （原始内容存档于2008-03-17）.